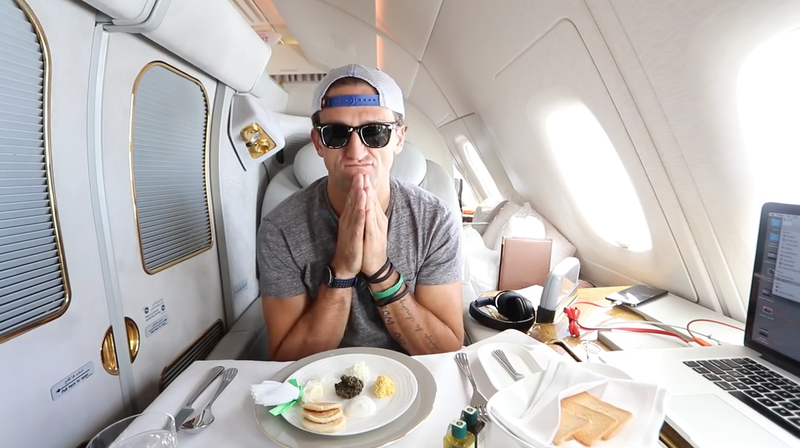 Emirates Airlines recently upgraded Casey Neistat to first class. He filmed the experience, and it's a nine-minute testament to obscene flying decadence. There's a drinks bar that magically slides out of the windowsill at the push of a button. There's a cooked-to-order menu that includes 21-year-old scotch and caviar. There's all kinds of swag, including slippers and pajamas, and a chair that converts to a bed (complete with a flight attendant to make it). Set largely in a secluded pod with a set of mechanical doors, there's also the centerpiece—a five-minute shower at 43,000 feet above sea level. The airline gave the YouTube filmmaker a courtesy bump on a 14-hour flight from Dubai to New York. And while the resulting video emphasizes that the company didn't pay Neistat for the coverage, it certainly got incredible value out of the deal. By taking him from business class, where tickets on a similar one-way flight run about $5,000, to the top-of-the-line experience, which Neistat bills as a $21,000 value (though it can go for as "little" as $9,000), Emirates earned itself a lengthy piece of content that's drawn more than 8 million YouTube views since Monday. Neistat has happily done paid work for brands including Nike and Mercedes. In this case, he seems pretty psyched about the Emirates perks alone. That's understandable, given nobody likes to spend hours hurtling through space in a tin can, sardine-style—even if his original ticket was presumably a notch or three above the average cattle coach airline experience. At the same time, the shameless degree of pampering that the airline slathers on its first-class customers is a bit eyebrow-raising, and a tone of tongue-in-cheek incredulity permeates Neistat's whole exercise. It's an occasion on par with the birth of his children, he jokes. And to be fair, someone could probably comfortably deliver a baby in that seat.